Welcome to the Artistic Outpost October Referral post! Our challenge for the month of October is Anything Goes using Artistic Outpost Stamps. Again, this months challenge has no theme, we'd just like to see your creations with Artistic Outpost stamps. This challenge will be open for the entire month, and you can enter as many times as you wish, provided you follow the challenge rules. 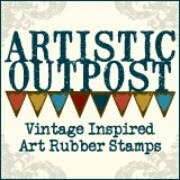 The winner of the monthly Referral Program will receive an Artistic Outpost Prize Package! To be eligible for the Artistic Outpost October Referral Program, please use Artistic Outpost images along with the challenge theme Anything Goes Artistic Outpost. 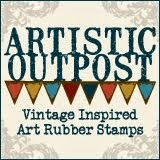 When uploading your image to your blog or online gallery, be sure to include stamp credits with an active link to www.artisticoutpost.com then leave a direct link to your creation using Link Tool feature on the months Referral Program post here on the Artistic Outpost Blog to be entered into our monthly drawing. Please try to limit your projects to Artistic Outpost images only. Note, links left here on the Artistic Outpost Blog need to include a direct link to the project you have uploaded. Projects can be posted on blogs or online galleries, but links left on the Referral Program post must be direct links to your projects. Links left with general links to galleries/albums/blogs will not qualify as our time is limited and we cannot search through pages of entries to see which upload uses Artistic Outpost images. Please use this post to leave your links for October, all links must be posted by 10/31, 11:55PM CDT to be eligible for the October Referral Program. The winner will be chosen through a random drawing and will be posted here on the Artistic Outpost Blog, be sure to check back in November to see if you've won. Remember entries must be for the current month in which you are posting and must follow the challenge theme. We're looking forward to seeing your creations using Artistic Outpost images. Decided to try my luck at this challenge again. My stamp of choice these days! Grab our Fan Badge for your blog!